The good thing about being a Four Seasons collector is that there is always some anniversary to celebrate and some good music to remix. Everyone is doing it. ‘Beggin’ (The Pilooski Re-Edit) hits the shops soon in the UK and will celebrate that track’s original release in 1967. This time it looks like being a hit in only a slightly changed form. It benefits greatly from the changes. 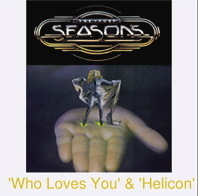 But we want to move on 10 years and celebrate 1977 when the NEW Four Seasons toured the UK for the second time in 2 years with their new album ‘Helicon’. We were all there helping to promote what turned out to be a very disappointing album after the excitement of the “Who Loves You” album a year earlier. 30 years on it is time to gather the body of work of this talented soft-rock group. They may have gone by the name of the Four Seasons and been able to back Frankie Valli through his 60’s hits on tour but these were hand picked singers and musicians with great talent. They were the only line-up of the group to have a chart hit without Frankie Valli being on lead vocal with ‘Silver Star’ ( UK nr 3 in April 1976). For so many years their tracks, apart from the big hits ‘December 63’ and ‘Who Loves You’, have been lost on vinyl and not presented in the sound quality we would love. The 2 albums they completed with Bob Gaudio and Frankie Valli in 1976 and 77 owe much to the years at Motown when the pair couldn’t find a formula for a different sounding Four Seasons. The changing sound of the Four Seasons started to develop in 1967 when ‘Beggin’ should have become a street anthem and ‘I’m Gonna Change’ set a standard that would reverberate around the Northern Soul dance floors of the early 70s. Experimentation back and forward with different line-ups produced a fascinating range of music (some of it captured in the just released ‘Jersey Beat’ box set).The result of this process and the peak of this period of creative change was the line-up that featured on these two classic albums. ‘Who Loves You’ benefits from the legacy of Motown in several tracks bought out with that contract before they joined Warner Bros in 1975. A combination of smooth blue eyed soul and funk rock set a sound apart from everything else at the time. This was something Bob Gaudio always sought. Moving on, changing the sound, and this time with the idea that eventually a Four Seasons without Frankie Valli could achieve a market position as a concept group. Although the ‘Helicon’ album didn’t have songs as strong as on ‘Who Love You’ the standards of musicianship and vocal were higher and songs like the wistful ‘Long Ago’ and the harmonic ‘Rhapsody’ come close to matching their earlier efforts. With limited success the band died and the idea of a non Valli Four Seasons was dropped. Back in 2003 a Four Seasons fan sent us a personal CD he had made up in tribute to the group. Not the big hits or the early Philips album tracks. This collection focused on the way the group’s sound changed as they entered the wilderness years before they would emerge in the mid-70’s with chart hits once again. No other 60’s group succeeded in such a way re-emerging after a decade to re-capture the Nr 1 spot in both the USA and UK. Over the next year we will capture the style and sounds of these changes in this blog as we try to get the music from these wilderness years recognized for it’s creative content and available to fans of their ‘second sound’. And what better place to start than the eponymous track for this feature…’I’m Gonna Change’.Written by Petrillo and Cifelli who had gotten to know Gaudio at the time. The track was arranged and conducted by Artie Schroek. By 1967, the team that had created the ‘Sound of Frankie Valli and the Four Seasons’, was changing. They were pulling in different directions as their other projects were achieving success or satisfying their desire to try new things. They had recognized that the groups signature sound and style of songs would have to change. Their older fans who had bought the Vee-Jay and then early Philips hits by the bucket load where older and perhaps moving into the emerging rock scene. The younger fans would not buy the sound of yesterday and each of the creators where moving in different musical directions. For the first half of that year the formula for the Four Seasons was still successful as the Tremeloes proved by taking the Four Season ‘B’ side cover ‘Silence is Golden’ to No 1 in the UK charts on May 20th of that year. 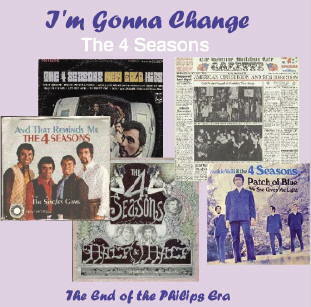 The Seasons themselves tried to use their experience and respond to the changing sounds emerging from rivals like the Beatles, The Beach Boys and Motown. Charles Calello was by this time at his peak working with Lou Christie and a range of other artists and he only did a couple of the tracks on the 'New Gold Hits" album. But with Artie in charge of this track everything worked. So much so that it would emerge as a floor filler in 1973 at the Wigan Casino as the DJ’s and the cult Northern Soul dancers recognized its quality. Our player features a remix which uses an expanded stereo image to bring the group and Frankie to centre stage with enhancement of the vocals to capture all the excitement of this track. The first of the changing sound that would run for 10 years……..why only 10?....you may ask. Well that will emerge as we feature more tracks from this period and the comments of guest fans from those days who will show why the ‘Changing Sound of the Four Seasons’ was so important then and now. Go to the side bar and visit the Collectors Choice CD collections to acquire the ‘New Gold Hits’ album.